Cricket Depth: Nick Compton - Time for recognition? Nick Compton - Time for recognition? For a number of years now, since the departures of all-rounders Paul Collingwood and Andrew Flintoff, the England cricket selectors have been searching for a quality middle-order batsman to fill the void left by the pair. Names like Bopara, Morgan and currently, Bairstow, have been given opportunities to stake their claim but none have successfully established themselves in the team. One man however, has quietly gone about his business in county cricket, and is now surely playing his way into the selectors thoughts – Nick Compton. Compton could join W.G Grace and Greame Hick in the 1000 runs club. The 28-year-old, who is a grandson of former England batsman Denis, is averaging a notable 85.50 in first-class cricket this season. Compton was born in South Africa but qualified to play for England after moving to the country as a teenager. He would of course not be the first to take this route if he was to make it to the international stage; amongst the current crop of England players, Andrew Strauss, Kevin Pietersen, Jonathan Trott and Matt Prior were all born in the rainbow nation. Despite playing for England Under-19s in 2001-02, Compton struggled to break into his first county side, Middlesex. He grew increasingly frustrated with his lack of opportunities at the club and secured a move to Somerset ahead of the 2010 season. The decision to switch counties has been extremely successful for the right-handed batsman, playing every LV County Championship when available for his new side. Although having not yet played for the England senior team, Compton is clearly in the mix for selection having been picked to play for England Lions earlier this summer against West Indies. This has often been used as a breeding ground for English players in the past, and should Compton continue to build on his impressive start in LVCC1 this season, he could just be the man England are striving for to come into their middle-order. Whilst it is hard to find faults with the case for more recognition of Compton, there is one cause for a grain of doubt which might be entering the selectors minds. The right-hander’s upturn in form has coincided with his move to Somerset, who play their cricket at Taunton. It is sometimes lazily suggested that runs are easy to come by at the ground; the term ‘batting paradise’ is often slumped into the same sentence as the word ‘Taunton’. This argument struggles to stand its ground however, especially as half of Somerset’s matches are of course played away from home. 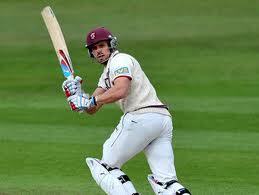 Besides, playing for Somerset didn’t do Marcus Trescothik’s international prospects any arm, did it? One thing is certain; there are more positives than negatives about Nick Compton. Should he replicate his early season form for the remainder of the county cricket year, he will be thrusting himself into the midst of a puzzling headache for the England selectors. As was alluded to earlier, there are number of batsmen in contention for a middle-order spot which is very much up for grabs in the England team. Stats alone would suggest Compton is the man for the job, but the added bowling abilities of other players like Ravi Bopara could be a decisive factor in selection. It will be fascinating to see if Nick Compton goes on to represent his country at senior level, 75 years after his grandfather made his own test debut.